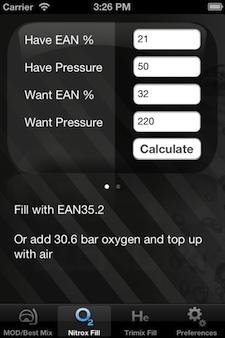 GasBlender for iPhone makes it easy to calculate EAN Best Mix, MOD and your refill mix on a continuous filling station. 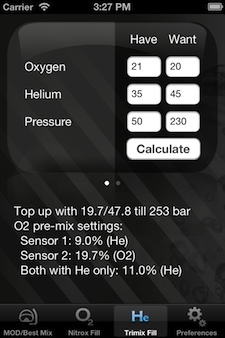 Furthermore you can calculate Best Mix and filling instructions on Trimix. Thank you for considering this app as a guideline for your future blends and dives. 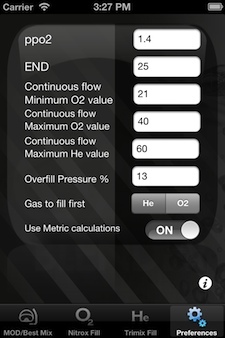 It has been developed primarily for my own usage - design and calculations are mainly what I need when planning dives. You are very welcome to e-mail me at feedback at gasblender dot dk to give feedback and suggest new features. Have few input fields, few buttons and numeric keypad for fast and easy use - blending calculations made easy. Preferences where you can set ppo2, END, and minimum and maximum values for the continuous blending station. Supports both Metric and Imperial values. 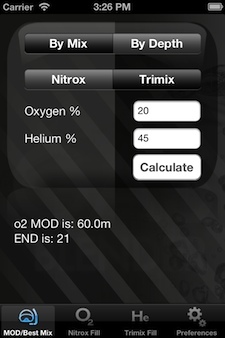 Tabs for calculating Best Mix and MOD for both Nitrox and Trimix, recutting tanks with Nitrox and Trimix. Calculations made by this app must be considered guidelines, they should always be cross-checked with your own calculations. The developer of this app takes no responsibility whatsoever for miscalculations and/or textual errors.